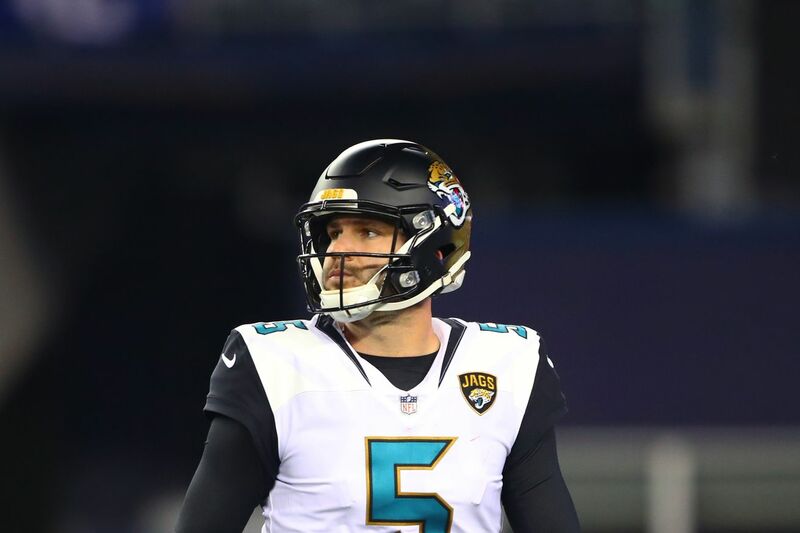 The Jaguars could’ve cut ties with Blake Bortles and cleared him from the books in 2018. Instead, he’ll be a sunk cost through 2020. Five years after taking Blake Bortles with the No. 3 pick in the 2014 NFL Draft, the Jacksonville Jaguars have parted ways with the quarterback. It was an expected move for a while, but especially after the Jaguars signed Nick Foles to a four-year, $88 million deal in free agency. Bortles, 26, sat behind Chad Henne on the Jaguars depth chart for the first three games of his rookie year before taking over as starter in Week 4 of the 2014 season. He then started the next 72 regular season games and three postseason games for the Jaguars. His 75-game starting streak is the longest in Jacksonville franchise history and the 25th longest streak in NFL history. For parts of that run, Bortles was a more than capable starting quarterback. In the last four seasons, he had 14 games with a passer rating over 100. The Jaguars were 10-4 in those games. But then Bortles had 16 games over that span with a passer rating below 65. Jacksonville was 2-14 in those games. Bortles’ 75 interceptions are the most any player has thrown since he entered the league. His 13 career pick sixes are tied for 25th all-time with Tom Brady, who has played in 14 more NFL seasons. Now he’s gone … a little too late. In hindsight, Jacksonville would’ve been wise to move on from Bortles and his $19.053 million fifth-year option during the 2018 offseason. Instead, the Jaguars decided the best way to go all-in on a Super Bowl run was to give Bortles a three-year, $54 million extension. That was a huge whiff, but it made a little bit of sense at the time. Kinda. The Jaguars came razor close to beating the Patriots in AFC Championship to get to Super Bowl 52. Leading the way for that team in 2017 was an elite defense and a league-leading rushing attack. Bortles wasn’t to blame for the Jaguars’ postseason elimination. He had a 94.1 passer rating in a 45-42 win over the Steelers in the Divisional Round and a 98.5 rating in the 24-20 loss to the Patriots. So the Jaguars decided it only needed a few tweaks — not an overhaul at quarterback — to get over the hump and into the Super Bowl. The extension also freed up over $9 million in cap space for Jacksonville to add a few pieces they thought would make the difference like Donte Moncrief and Austin Seferian-Jenkins. But things went south. Way south. Bortles regressed a bit. His struggles were made worse by the poor ply and absence of Leonard Fournette, a lackluster receiving corps, and an offensive line decimated by injuries. The Jaguars finished 5-11, a shockingly bad year after entering the season with loads of optimism. What makes the decision to bring Bortles back for another year really bad is now the Jaguars are stuck with the quarterback on the books for two more seasons. Hunting for an upgrade at quarterback is an overdue project for the Jaguars, and signing Foles might not even accomplish that goal. The $20.8 million cap hit for Bortles was set to be the team’s biggest drain on the salary cap in 2019, but cutting him will only save the team $4.3 million of it. The caveat is that the Jaguars wrote offset language into his contract that means his next team will absorb some of that remaining $16.5 million. For example, if a team signs Bortles to a $3 million deal to be a backup in 2019, the Jaguars get an additional $3 million of savings from parting ways with Bortles. Either way, he’ll count heavily against the Jaguars’ salary cap in 2019 and $5 million against the cap in 2020. Now, the Jaguars will hope Foles is an upgrade worth $22 million per year and the sunk cost of Bortles. That’s awfully optimistic.